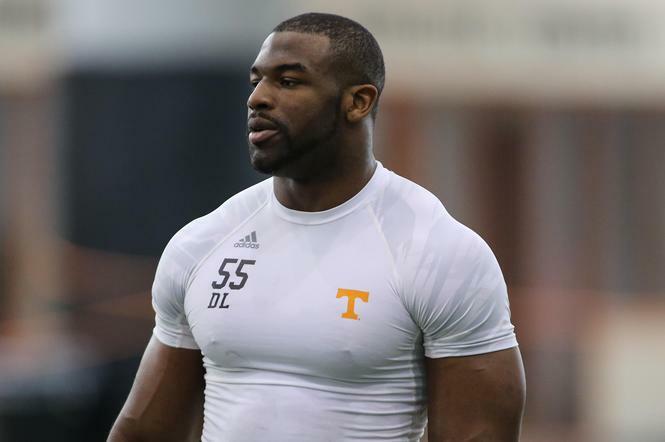 Life as a skinny guy can be difficult when it comes to gaining weight and adding muscle mass. I would know, I have been there. This was back in the 90’s when I was trying to gain weight and add some muscle for the upcoming football season. The problem was the weight gainers back then tasted like mud and they were not all that healthy. Luckily for you, the weight gainers of today taste way better and are way healthier than they were back in those days. These weight gainers will have you adding on pounds and when paired with a good workout plan will have you getting bigger fast. I’m sure you have had the idea of just stuffing your face with pizza and fast food like crazy to try and gain weight that way but that really isn’t the right way to go about it especially if you want to build lean muscle. Even for hardgainers there is a better way. Weight gainers are high in muscle building protein and clean calories that are what you will need to add muscle mass without the fat. 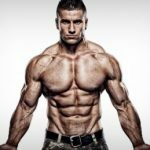 Let’s take a look at the benefits of taking weight gainer supplements as well as the need to know facts and then we will check out which weight gainers are the best on the market today. Good protein for muscle. Commonly whey or casein. 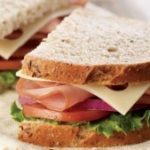 Over 50 grams of protein per serving – When it comes to a weight gainer that is going to help you build lean muscle you are going to need something with a good amount of protein in it. After all, protein is the building block of muscle so you will definitely need a good amount of it. Also, if you are going to be consuming all those calories it is best that a lot of them are from protein to help you add muscle rather than fat. Good source of fiber – You are going to want to be sure your weight gainer has a decent amount of fiber in it also. That’s another thing the weight gainers of years ago didn’t have was fiber. Back then if you took a weight gainer and didn’t watch yourself it would be constipation city. Luckily many of the ones that are out today have enough fiber to keep things running smoothly. Look for at least 4 grams of fiber per serving. At least 600 calories per serving – If you are going to build muscle you are going to need the calories. It’s a weight gainer, it better have at least 600 calories in it or you are really just drinking a regular protein shake with a different label on it. At least 75 carbs – Carbs are needed to build muscle and provide calories, if you are going to get big you are going to want carbs. That doesn’t mean just eating a bunch of sugary crap either that is loaded with calories, weight gainers should use good carbs that are slower to digest and that will make you grow lean muscle rather than adding fat. Weight gainer shakes can really be taken at any time of day when you are in need of calories. Many people take their protein shakes after they workout, you can also take a weight gainer shake after your workout but it isn’t always necessary. 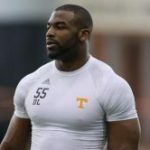 It should also be noted that when you are taking weight gainer shakes you will no longer to take the protein shakes you may normally be taking after your workouts, you will be getting more than enough protein from the weight gainer shakes to have you covered. One of the biggest things to keep an eye on with all supplements out there is proprietary blends. A proprietary blend is where the supplement company puts a bunch of ingredients together in what the call a blend and only give the size of the blend. This means you have no idea how much of each ingredient is in the blend, only the total size of the blend itself. This is not what you want if you want to know what you are getting for your money and if you want to know how effective the product might be. It’s also a bad idea for people who may be sensitive to certain ingredients and to avoid possible side effects. 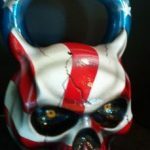 Any Side Effects of Weight Gainers? When it comes to weight gainers there really isn’t much you need to worry about in terms of side effects if any, if there are they will be they would be very mild. The one thing you may want to keep an eye on is gaining body fat. Some of you may be happy and even shocked to actually have some fat on your body. However, if you want to be sure you are just building lean muscle without the fat then you need to make sure your workout program is tight and your overall diet is on point. 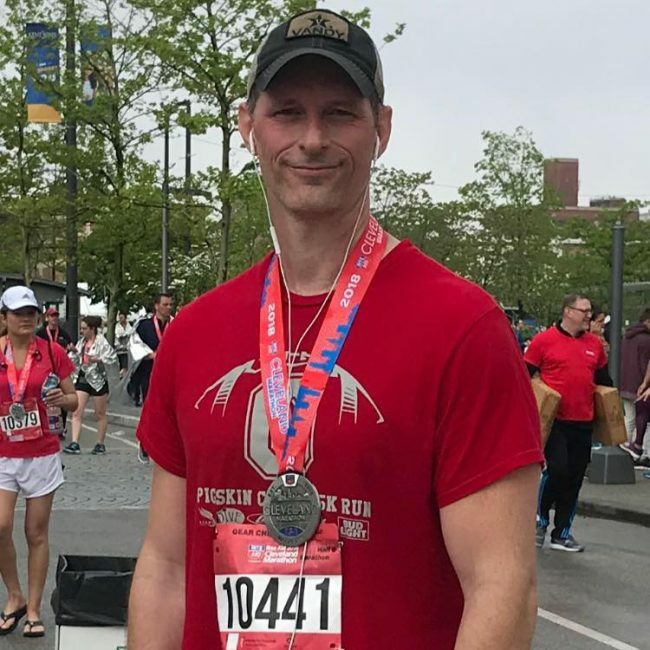 You need to be sure you are doing the right exercises when it comes to building muscle mass if you want to get the most out of your weight gainer. 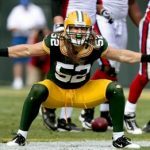 We have covered this topic extensively in this guide on how to build muscle fast along with the exercises that build the most muscle. We can give you a quick rundown of those exercises here though. If you want to build the most muscle you are going to want to stay with compound exercises. These are the exercises that use more than one muscle group at a time. Isolated muscle exercises should be used secondarily with compound exercises being the meat and potatoes of your workout. Here are some of the best exercises there are when it comes to building muscle. 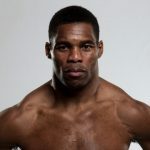 Ok, we have given you all the information you will need on weight gainers so let’s get to the actual list. After all this is what you came here for. 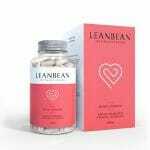 Topping off our list we have a really nice product from Transparent Labs. The ProteinSeries Mass Gainer is an incredible product that truly uses top of the line ingredients. 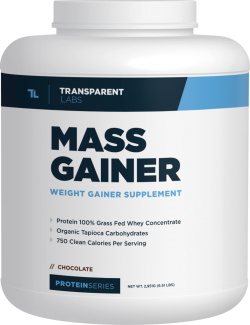 Mass Gainer has really gone all out to make a weight gainer that is as healthy as it can be. Their main ingredient is an organic whey protein that is derived from grass-fed cows in New Zealand. It is 53 grams of the purest whey protein you can find in a weight gainer shake. The carbohydrates in Mass Gainer come from organic tapioca, oats and sweet potato sources, some of the best and cleanest carbs there are, perfect for building lean muscle rather than fat. These carb sources are also high in fiber as each serving boasts a nice 8 grams of fiber. Another thing we really like about Mass Gainer as a muscle builder is the fact that they include 3 grams of creatine monohydrate in each serving as well. 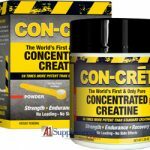 If you have followed this site for any amount of time you know how much we love creatine as our top muscle and strength builder so adding it to a mass gainer shake is huge and is a sure way to build muscle even for the biggest hardgainer. 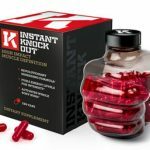 If you can’t build muscle while on this product you need to take a serious look at your workout program. Cost – Not surprisingly a product this good is above average in cost. Coupon code TL10 should work to save you 10% though. Overall Mass Gainer is a very high-quality product that we feel strongly about having in first place especially if you want to build lean muscle. The ingredients are the best on the market and the fact that they added 3 grams of creatine monohydrate is just the cherry on top. There really isn’t much not to like about this one, the reviews are outstanding and so is the product. The price may be a bit much for some but it is extremely high quality so a higher price is expected. Mass Gainer is head and shoulders above the rest. 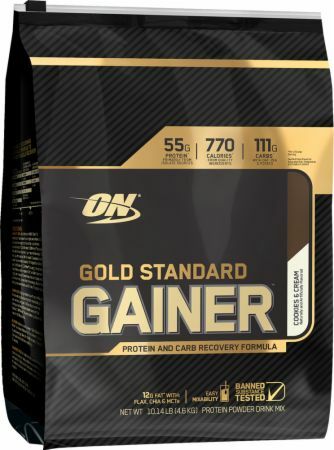 Coming in second place we have another really nice one with Gold Standard Gainer by Optimum Nutrition. This one is quite a bit like our first place finished with only a few differences. Gold Standard Gainer has 55 grams of protein from a blend of protein sources including whey protein isolates, milk proteins, and regular whey protein. For its carbohydrates, it uses quality carbs like oats, peas, and potatoes. It also has a 2:1 ratio of carbs to protein which is right where it should be. This one has 760 calories per serving and they did a nice job getting in 6 grams of fiber. This is good because fiber is your friend with weight gainer shakes. We also like that they added some healthy fats from quality ingredients like Flaxseed and Chia. This one also has some really good reviews online and is known for mixing easily and going down smooth. Taste is also above average with this one. Overall this is another really nice product. It features some good protein, fat and carb sources and has a nice amount of fiber. We do wish it used creatine for more muscle building and overall it just isn’t as clean of a product as the first-place finisher. 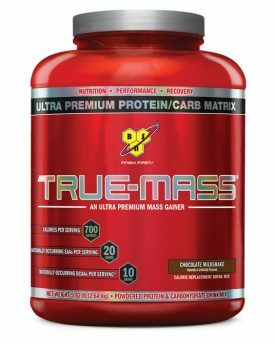 Next up we have True-Mass by BSN. This one is built not only for increasing size but also for building strength and helping with faster recovery. Taking a look at the ingredients they use a blend of proteins to deliver 50 grams of protein per serving. They use a sunflower powder for many of the carbohydrates which is nice but not quite good as the first 2 products we covered. This one also has about a 2:1 ratio of carbs to proteins which is where you want to be. They also have 6 grams of fiber per serving. Another thing to highlight on this one is that they added a nice dose of muscle building BCCAs and Essential Amino with 30 grams of the two combined, that is a serious amount of amino acids right there. The reviews on this one are good as well. Most notably people really like the flavor. This one is probably the best tasting product on the list. We generally go for effectiveness of the product over flavor but if the flavor is your main concern then this might be the one for you. It is also pretty effective but not the best if you want lean muscle. Overall this one is another pretty nice product overall. It’s a little lower in price than the first two and not quite as high in quality but it is still a nice product to consider. They also make a version called True Mass 1200 that has more calories and carbs in it but that is more likely to add fat rather than lean muscle. We like this product to add muscle size without the fat. Especially since both of them have about the same amount of protein. 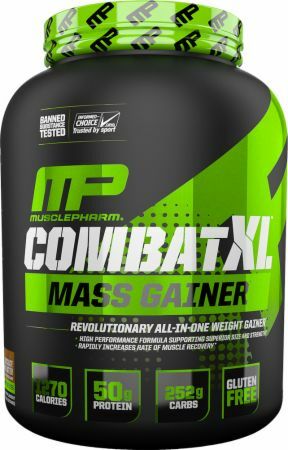 Coming in fourth place on our list of the best weight gainers that build lean muscle we have Combat XL Mass Gainer from MusclePharm. This one features 50 grams of blended proteins along with 252 grams of carbs and 1270 calories overall. For the carbs, they did a nice job and went with sweet potato, alfalfa sprout quinoa and brown rice flour. Healthy fats are provided by flax seed and chia seed. All of these choices are excellent. Unfortunately, there is no fiber in this one so there is a chance this one could leave you bound up. 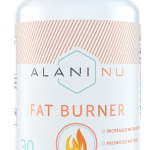 Reviews on this one say that it has a super sweet flavor and the hardgainers say it works well at adding lean muscle without the fat which is just what are looking for. This one is another good choice but it is missing a few things. Overall, we really like the ingredients in this one but it’s what they left out that we aren’t so sure about. 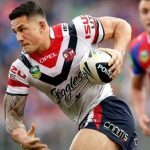 No fiber, no BCAAs and no creatine is the reason this one isn’t higher on the list. 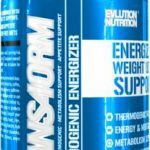 It is a good product and will build lean mass but it could be better if they added a couple more ingredients. 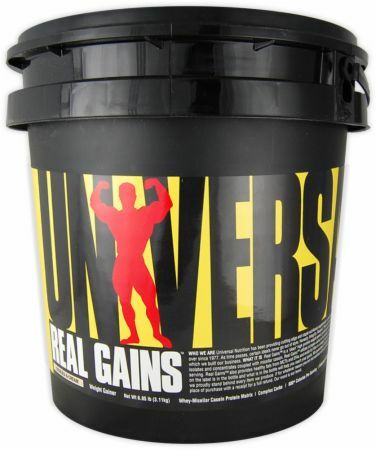 Rounding out our top 5 we have Real Gains by Universal Nutrition. This one is another one that you might want to take in to consideration. Taking a look at the ingredients this one also uses a blend of proteins and has 52 grams of protein per serving. For carbs, they use a nice amount of complex carbs using soy and flaxseed powder. This one is also nicely loaded with amino acids for muscle growth. Looking at the fiber this one is a bit low at only two grams per serving, we would like to see at least 4 grams. The reviews, of course, are good with this one too, people like the flavors and it has been effective for weight gain with many people. This one is also the least expensive on the list so if you are on a budget you might want to take a look at this one. There you have the best 5 weight gainers on the market when it comes to building lean muscle. We really like the ProteinSeries Mass Gainer for its super clean and organic ingredients, grass-fed cow whey and the creatine they added, it is a pretty awesome product. The Gold Standard Gainer is also a really nice product as well. You can’t go wrong with any of the products on this list but those two are definitely the best.